This London Fashion Week started off brilliantly for me as I was lucky enough to be invited to Kurt Geiger’s blogger breakfast event in their Covent Garden store. I was up bright and early to check out the highly anticipated new collection by former Victoria’s Secret model Karlie Kloss. Karlie Kloss is the new face of Kurt Geiger for their their SS16 ad campaign and I am seriously excited about this collab. Karlie is a huge inspiration for me because she works so hard with everything she does; if she’s not strutting down a runway or featuring on the cover of a glossy mag, then she’s in the gym working on her now infamous physique. She seems to be doing it all and that’s exactly what this campaign is about – The woman who does it all, stylishly. For a girl like me who only ever owned a pair of trainers for the purpose of PE lessons, it was going to be a real test to see whether this collection really did find the right balance between sporty footwear and high end fashion. The general theme is sports-luxe and this is one I haven’t always been a fan of. I’m not going to go into this too much though because after seeing all the footwear in the SS16 collection, I have fully changed my mind. Sports-luxe can be done and boy has it been done well. All the footwear in this collection is unbelievably sleek yet still really easy to wear but what I love the most is that each pair has it’s own little quirk. From fun fluffy pom poms to a bold catchy slogan across the shoes, there’s something for everyone. The shoes are absolutely stunning and KG have even used only the best shades of colours for each pair including, midnight blue, dusty pink & khaki green. Kurt Geiger were kind enough to gift me a pair of shoes which I cannot wait to feature in an OOTD style post or two. I opted for the Ladbroke flatform lace-up in dusty pink and I’m not even kidding they are so beautiful. You can just see that they’ve been really well made and the detail on them is what drew me to them immediately. 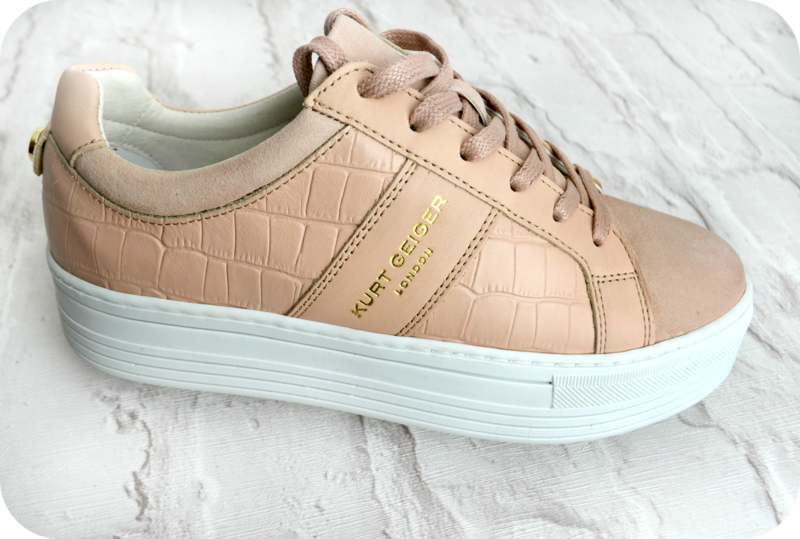 The outer is made up of faux croc leather with a suedette top cap, finished off with “Kurt Geiger” embossed in gold along the side. They’re so beautiful to look at but the real test was for me to try them on! I was slightly worried because I do have ridiculously wide feet and shoes in general don’t usually agree with me but when I say these beauties are comfortable, oh my good god, my feet felt like they were in heaven. Luckily the laces mean that I can make them wider and lace them up to fit me as needed. The flatform heel makes these shoes a lot less sporty and a lot more girly, so they’re much easier to style. Along with their new shoe collection, Kurt Geiger are also bringing out bag charms for SS16. They’re so cute that I found it really hard not to fall in love with them when I saw them at the bloggers event. I started imagining how amazing it would look on all my bags pretty much straight away. They’re made of acrylic and come in 6 different colours, ranging from subtle to full on quirky. I love the alphabet charms and wanted to cry with happiness when KG gifted me a bag charm too. I got the letter R in black and ever since it’s been in my possession, it goes with me wherever I go. I love personalising things and you can imagine how happy I am at the fact that I can now set apart my bag from everyone else’s! These charms make great gifts too. I’m definitely going to be purchasing a few of them for as an additional birthday present for friends and family, besides for £12 you can’t really go wrong! If you haven’t already, check out the Karlie Kloss x Kurt Geiger collaboration and prepare to lust after the entire collection! What’s your favourite shoe?